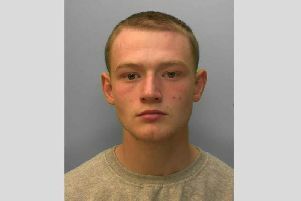 New Ministry of Justice data reveals that Sussex Police convicted or cautioned 408 people in the 12 months to June, either for possession of a knife as a weapon or threatening someone with one. Of those 109, or 27 per cent, had at least one previous offence for carrying a knife, and 23 of the criminals had three or more past offences. That figure has increased since 2014-15, when 74 of those successfully prosecuted had reoffended. Police bosses say this could be down to improved identification techniques. Mr Green said treating knife crime as a public health issue, which is beginning to be adopted in some parts of the country, could start to tackle the “underlying causes of knife crime”. Across England and Wales the number of reoffenders increased by 35 per cent over the last three years. In Sussex, in 2017-18, 49 children were charged with knife offences. This was a 36 per cent rise on 2014-15. A National Police Chiefs’ Council spokesman said: “Proactive policing, and a rise in successful identification of knife carriers by forces, has played a role in the rising number of knife-carrying offences that are prosecuted. He explained that preventing youngsters from carrying knives requires help through education and the community, as well as the police. Overall four per cent fewer people were successfully prosecuted by Sussex Police with knife offences in 2017-18, compared with the previous 12 months. Of those 396 were for possession of a knife as a weapon, and 15 for making threats with a knife. A total of 117 offenders were sent to prison, 97 were given community orders and 49 received a caution. A Ministry of Justice spokeswoman explained that the proportion of knife offences resulting in a caution across England and Wales was at its lowest level ever. She said: “Through the Government’s Serious Violence Strategy we are working to prevent young people from ever picking up a knife in the first place and our latest figures show we are catching and prosecuting more of those carrying a blade, and sending them to prison for longer.